What is extra exciting about this tour is the leading actors, Darren Criss (made famous by Glee) and Lena Hall (Tony Award Winner for her role in Hedwig and recent guest star on HBO’s Girls), are both San Francisco natives. Katie was lucky enough to have a phone chat with Lena Hall before she headed to SF to kick-off the tour. We learned that she grew up in the Haight, was raised by parents who were dancers, attended Ruth Asawa School of the Arts in Diamond Heights, is a fierce supporter of arts for young people and is Katie’s new girl crush. 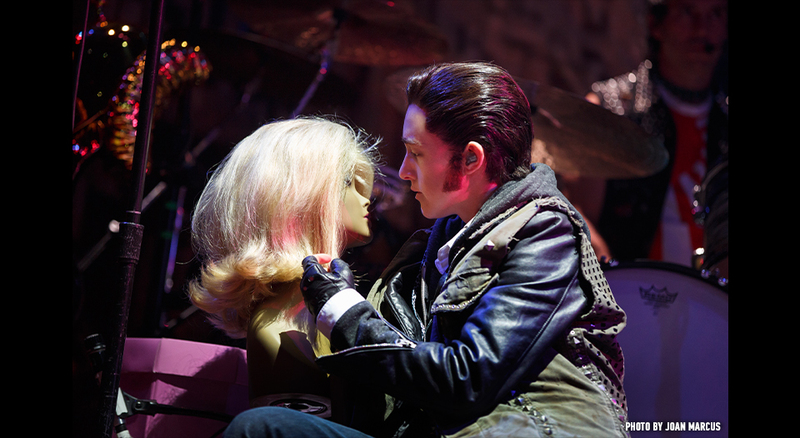 Lena Hall in her Tony Award winning role of Yitzhak in Hedwig and the Angry Inch. Katie: How have you seen the arts scene change in San Francisco since you were a kid? Lena: I feel like the arts scene is very different from when I was growing up, in fact I think it’s a lot less (art) than when I was growing up, which is unfortunate. A lot of it has to do with the rising prices of rent. I grew up in the Haight-Ashbury, Upper Haight, and it used to be so colorful and different. Now it’s starting to lose its soul. Part of what made, and makes, San Francisco so great is that it has so much culture; but that culture is starting to get squandered by money. The arts are what makes the city appealing, the arts are what make a city viable and interesting. I hope there will be the desire to focus on that and emphasize the arts in San Francisco. K: What is making you excited to perform Hedwig here in San Francisco? L: I’ve never done a big production in SF, so this will be my first big show home coming. I get to perform the role that I won the Tony Award for, which is really cool, but what is really, really cool is that I get to play Hedwig! It’s like the year of the woman, we are just as badass as the guys are and guess what? I’m doing both roles in the same production, and will do both roles on the same day. I’m so in love with this show, and it’s such an honor and opportunity to play both roles. I’m beyond grateful for it. I’m just so excited to bring it home and do this in our home town. Hedwig and the Angry Inch opens next week! If you want to see some homegrown celebrities rock it in a very San Francisco musical go out and get your tickets now. Right now there are still tickets on Goldstar for opening night or you can get tickets on the SHN website. Drama Talk & Drinks will be seeing the show and reporting back. If it’s half as great as Lena, it’s going to be fabulous! *If you want to see Lena make history being the first female to play Hedwig in a major Broadway tour, make sure to go on the following days: Sunday, October 9 at 7pm, Wednesday, October 12 at 8pm, Wednesday, October 19 at 8pm, and Wednesday, October 26 at 8pm. Drama Talk & Drinks: Interview with 3GT's AJ Baker - "Putting women's work onstage where it belongs!" Drama Talk & Drinks: "There aren’t a lot of black people left in San Francisco"